I recently saw one of the best adoption videos I've ever seen. This video is of a friend and her family meeting their almost 4 year old son for the first time. It made me cry... in a good way. It's just so heartwarming -the excitement on the little boy's face when he sees his new parents, his foster sister nudging him toward them, the way they all react meeting the newest member of their family. It will melt your heart. I was doing a little research for a friend who is contemplating adoption as a way to build her family. I came upon this great post, which pretty much sums up my thoughts at the moment regarding adoption. She then links to other bloggers who tackle the issues of honoring first families, living as a transracial family, and one who lists organizations that help keep families intact. Amazing stuff here. I would consider this a must-read for all families considering adoption (and all adoptive families, too!) I also enjoyed this blogger's perspective here. So much of what she had to say resonated with me. As I was clicking on these links, I came to this video of a family who shares their adoption story and also their experience adopting from Haiti in the midst of the earthquake. The mother was actually in country when the earthquake occurred. It's another beautiful story of one family's adoption journey. 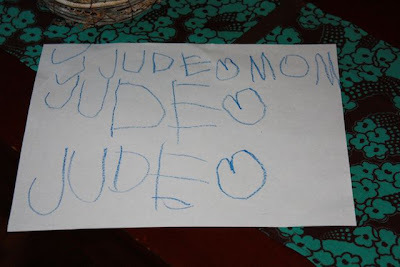 Off the topic of adoption, but to add a bit of my own warm-and-fuzziness, here's a photo of what I am calling Jude's first written sentence. It says Jude [heart] Mom for those of you who don't read kindergartner. OK, I got all teary reading that sentence.....why do I love that stuff so much? Worth a million bucks in my opinion.